Growing up, my favorite story my mom read to me was Brer Rabbit. She created a great voice for the rabbit that always made me laugh. Brer rabbit lived in the South and would tell Brer Bear when captured, "Please don't throw me in the briar patch." Using reverse psychology, Brer Rabbit knew the dense thickets of vines would allow him to escape harm. In sweet memory of Brer Rabbit, today's Leaves and Trees feature is all about one of the most prevalent vines of the South, the Greenbrier. 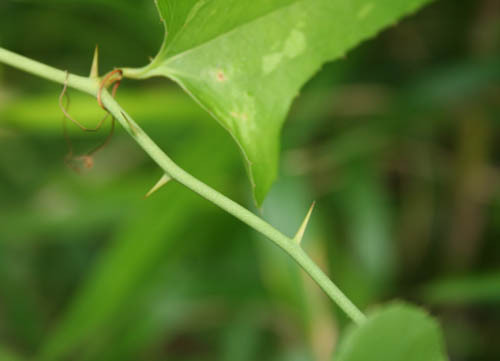 Large thickets of prickly thorns make up this vine often found in wooded areas. Besides offering protection for wildlife, the whole greenbrier vine is quite tasty. Rabbits and white tailed deer rely heavily on the greenbrier for sustenance. The sprouts of greenbrier are edible to humans with a bright, full bodied flavor. I love to eat them on my hikes with Kathryn (just be sure what you're eating.) If you steam the new growth sprouts, they call it 'po' folks asparagus' down South. This hearty vine can be used to make soups or 'Greenbrier Salad.' (that would be so fun on a menu) The root powder can make a mild jelly or be diluted in water for a cold drink. In fact it used to be the ingredient that added the licorice flavor in Sarsaparilla. Kathryn took this really wonderful photo above. The leaves are generally heart shaped but can also be laurel or oval shaped. One thing Kathryn really loves about the waxy leaves is what they offer in the colder months of the year. In the late fall and early winter, greenbrier leaves turn a vibrant red, yellow and green and when backlit, they appear to glow. In the gray and bland winter forest, you can count on greenbrier to offer a little sunshine.